Rider - my first pixel art since 1993! Uses the Amiga 12-bit colour palette. Based on 'Death Dealer' by Frank Frazetta. I agree with DonDidDon, it also reminds me the Witch Haven for DOS. This makes me think of the front ocover of "Witch haven" game. Can you fix it again?? Its big and impressive on 1st sight. The composition is snappy ! Lacks detail and looks sort of vague on closer look though. Dithering never looked so good to me before! It's a shame Frank died recently. i love frank frazetta's fantasy artworks man! he is one of my influences and bow to.nice job! Awesomeness ... job well done! Wow, "Prisoner of the Horned Helmet" by James Silke is one of my favorite books. You really captured the Death Dealer here, great job. I would LOVE to see the full thing with the horse, BTW. Ooh!Snazzy!Those clouds in the background look very cool. good balance of colors ... a top pixel art ! The dithering is near perfection. 5 from me but it looks a lot like Ishan's Shade (from M:tG). Not like it's hard with al those curly helmeted folklores. Good job! Nice color scheme. overall 5* from me. great work. Totally awesome, I especially like the sword on the chain in the background. Enjoyed watching the WIP, thanks. Thanks for your great comments . They are really appreciated. grave: I'd like to do the full piece, with the horse - one day, perhaps. At the moment I'm working on a new style (for me) - aimed at what I've seen on pixeljoint, and what I see as the modern way for pixel gfx - a cleaner feel rather than wasting pixels to AA. Ironically back in the Amiga days we dreamt of infinite colors & high resolution, we antialiased everything to compensate for low resolution, and would have given our right arm for Photoshop. I love the fact that today, with all the available hi-tech gfx packages, people are still restricting themselves to 12-bit pallettes, 320x200, and discussing techniques in overcoming restrictions that haven't been a problem for 15 years. This is so awesome. I loved watching the WIP. I really love frazetta. And this pixel version of his painting is great to. Maybe you could do the full piece? 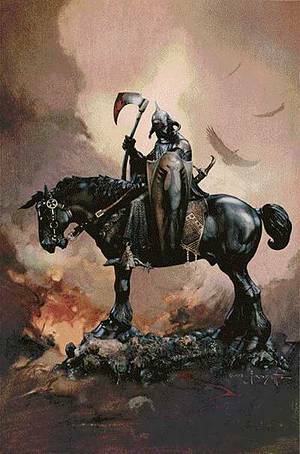 Added reference to 'Death Dealer' by Frank Frazetta to the desc. Ok Helm, I'll bear that in mind for the future. My next piece will be original. SeanGraal - dpaint was a graphics tool for the Amiga. Yeah, I mean in the description.